Enterprises are relying on WANs to carry more data than ever. With cloud computing, offsite disaster recovery and big data on the rise, it's more important than ever for IT professionals to boost application performance across the WAN. However, times are changing. 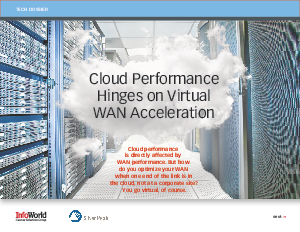 Instead of deploying a physical WAN optimization appliance to improve application performance, the industry is moving to a better approach - virtual WAN acceleration software. It can be downloaded in minutes, runs almost anywhere, and controlled with the click of a mouse for maximum flexibility. In this report we not only explore the requirements for virtual WAN optimization but compare how Silver Peak's virtual WAN acceleration stacks up against Riverbed's physical Steelhead appliance.